Bud Light to Eagles: Philly Philly! PHILADELPHIA -- Bud Light has changed its catchphrase of 'Dilly Dilly' to 'Philly Philly' - just this once. Bud Light's ads featuring a medieval king, queen and their subjects raising their beers in an enthusiastic toast have been all over television for the past six months. "@Eagles of Philadelphia, thou hast fought long and hard to get here. Heed thy King's words and thou shalt emerge victorious," Bud Light tweeted Sunday. 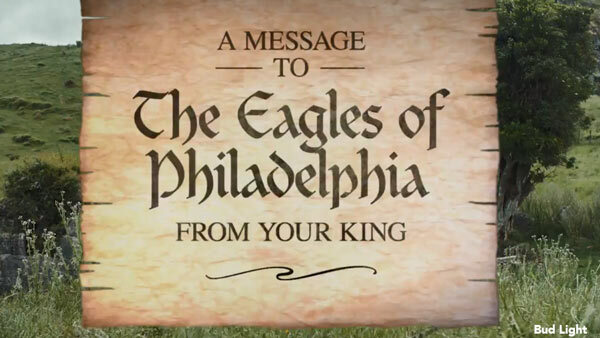 In a video posted on social media, the Bud Light king spoke to the Philadelphia Eagles. "I'm surprised to see you guys here. I thought it was all over," the king said, referencing the underdog postseason of the Eagles. "So for you, I'll say it only once. Philly Philly!" the king toasted. Last week, Merriam Webster chimed in on the 'Dilly Dilly' phenomenon and confirmed it is indeed a word. "A dilly is delightful, and that's not a coincidence. The noun comes from an obsolete adjective dilly that means 'delightful,' and that likely came about by some nipping and tucking of the word delightful itself," Merriam-Webster said on its website. Speaking of Bud Light, before the season began, the brewer promised tackle Lane Johnson that if the Eagles win the Super Bowl, they will throw a party for Philadelphia. Lane Johnson promises beer when Eagles win Super Bowl.